This blog is the second in a series leading up to Pink Vail, the world’s biggest ski day to conquer cancer, March 21, 2015. See the first blog, Wear Pink to Help My Dad. Duct tape does not cure cancer. But in the case of Anne Trumpower, it has healed hers. Trumpower is known as the “duct tape lady” to those who have attended Pink Vail™, the world’s biggest ski day to conquer cancer. Since the event’s inaugural year in 2012, Trumpower has donned a one-piece ski suit, which she has duct taped from top to bottom—in pink, of course. On her back, she has taped a number to mark the years she’s been cancer free. On March 21st, when an expected 2,500 participants take to Vail Mountain in everything from pink spandex to boas and bras, Trumpower will be wrapped in duct tape with the number 12 on her back. 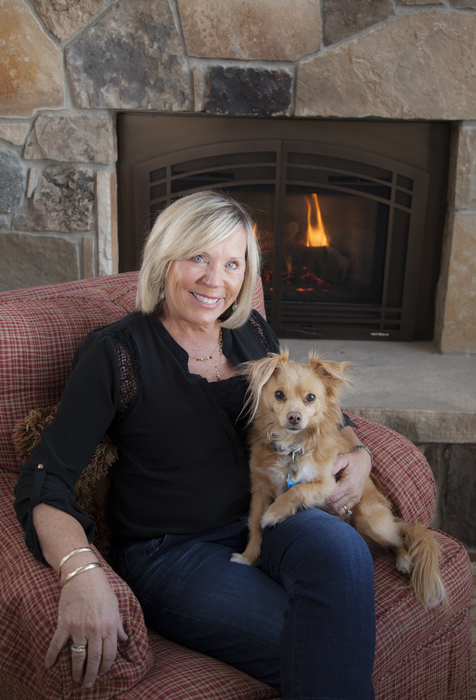 Because of her active lifestyle and passion for the outdoors, Trumpower received chemotherapy and radiation treatments in the afternoons so she could ski during the day. She took advantage of free fitness classes offered through the Spirit of Survival program, which is funded by Pink Vail. “They helped me get stronger and feel stronger,” says Trumpower. Trumpower isn’t the only patient to take advantage of Shaw’s growing Spirit of Survival program. In 2014, Pink Vail provided 1,352 free fitness sessions, 848 emotional support sessions, 492 massage or acupuncture sessions, 423 nutrition consultations and funding for hundreds of participants to enjoy group snowshoes, cooking demonstrations, art and pottery classes, hikes and educational lectures—all at no cost to Shaw’s patients. These services can dramatically impact quality of life, but are not typically covered by insurance. Programs like Spirit of Survival –not to mention the relaxing setting of Shaw Regional Cancer Center and its breathtaking views of the Sawatch Mountain Range—set Shaw apart from cancer centers around the country. 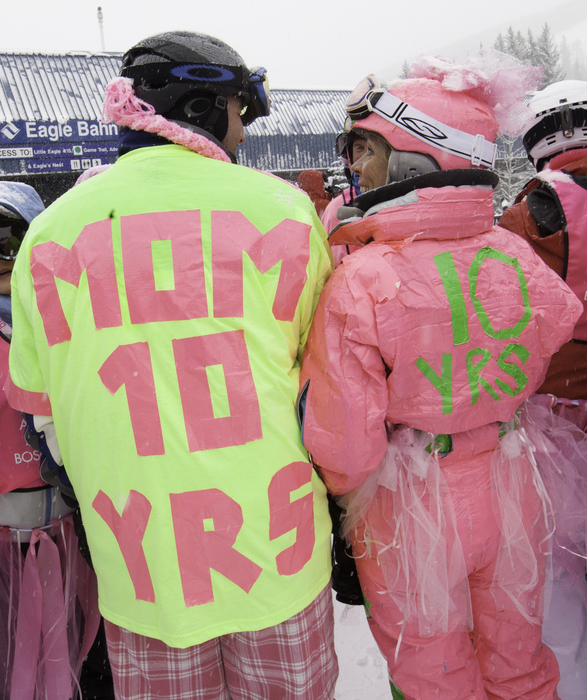 Presented by Helly Hansen, Pink Vail is hosted at the top of Vail Mountain at Eagle’s Nest and includes all day live music, deck parties, a costume contest and the Celebration Ski Down. All ages and abilities are welcome, and you don’t have to ski to participate. Similar to a run or walk to support cancer, participants register at www.pinkvail.com and invite friends, family and co-workers to join their team or make a donation on their behalf. 100% of the proceeds from Pink Vail stay in the community. Pink Vail has raised over $1 million in its first three years, and the fundraising goal in 2015 is $500,000. Participants have ranged in age from 2 to 84 years old, and come from all over the U.S. with donations pouring in from all 50 states and nearly a dozen countries. Pink Vail funds the “Spirit of Survival” program, which offers all cancer patients and survivors at Shaw Regional Cancer Center the opportunity to receive free exercise training, nutrition coaching, emotional support, outdoor adventures, a nurse navigator, massages, alternative treatments and more. Pink Vail wouldn’t be as successful without the support of national and community partners like Helly Hansen, Vail Mountain, Epic Promise, Town of Vail, Vail Valley Surgery Center, Maui Jim, Diversified Radiology, Smartwool, Coors Light, FirstBank, Slifer Smith & Frampton, Head skis, Larkburger, Bula, Chateau d’Esclans, Wyndham Vacation Rentals, The Arrabelle at Vail Square, Four Seasons Resort, Takeda Oncology, Mountain Beverage, New Belgium Brewery, Genentech, 104.7 The Mile, Korbel, Chambord, Crazy Mountain Brewery, Dusty Boot, GE Johnson, Luminate Advertising, Astrazeneca, US Bank, Centennial Bank and Vail Daily. Shaw Regional Cancer Center at Vail Valley Medical Center is for anyone seeking comprehensive cancer care in a peaceful and intimate setting. Patients travel to Shaw for their Ivy League doctors, top-of-the-line equipment—including the best technology available for radiation therapy and 3D mammography—and impeccable reputation for breast and prostate cancer treatment. The multidisciplinary approach of their cancer care team benefits each patient’s individualized treatment plan, supporting the patient and family through treatment all the way to survivorship. One of the country’s premiere boutique cancer treatment facilities, Shaw Regional Cancer Center has been recognized and accredited by some of the top cancer organizations in the country, including the American Society of Clinical Oncology Cancer Foundation®, Susan G. Komen for the Cure®, American College of Surgeons Commission on Cancer (CoC) and the American College of Radiology (ACR).